----- The world is a wonderful place. It is marvelously ordered, with every planet in its proper place and each little electron spinning with the right spacing. ----- Even locks have their order and organization. It takes a while for boaters (and lock tenders) to catch on, and some never do - but, this is not the place to practice with Chaos Theory. -----Let's play with some chaos, just for fun. Ten boats all arrive at a lock within a few minutes of each other. Five are bound upriver, and five are heading down. Who gets to go first? Who determines and enforces the order of passing? -----Well, the last question is the easiest to answer. The lockmaster is in charge. He is the ultimate boss of the lock and, believe me, most of them know it. OK. Where does he get his authority? Simple answer again. His lock is owned and operated by the United States Army. That's right - his paycheck comes from the Army. Now, that's authority! The U. S. Army Corps of Engineers runs most of the locks in the United States. Oh, sure, there are the few that are state-run, some are managed by parks, and others by other government agencies - but most are the fiefdom of the Corps. So, listen up, buster, the Army's in charge. -----All right, now let's straighten out that mess of ten arguing boats. The general rule is: Among equals, first come, first served. What? Now that's sure to generate some lock rage. Imagine ten cars arriving at a four-way crossing, with no stop signs. There's chaos. However, at the lock, remember, the Army is in charge. Therefore, the lockmaster decides who was first. He generally takes note as to which boat hails him first, on the radio. He usually keeps a list of the hailing order. Any disagreements, and his decisions are final. -----Hey, wait a minute - what was that qualifier, "Among equals?" Not all boats are created equal. And the Federal Government has the right to determine who is more equal. Therefore, like so many army regulations, there is a clear order of priority. -----Let's start with the last place - the lowest guy on the totem pole - the piece of flotsam out there in that arguing mess. Yep - you're right. That means you - and me! The "pleasure boater" is the lowest of the low and the last one to lock through. A cynic might say, "Of course, that's because we're the folks who pay the bill - our taxes pay for that lock and the lock tender's salary." -----So, there is a legalized pecking order, set by federal law, and we're at the bottom. OK, we're used to that, but who's on the top of the pile? Naturally, the guys who make the rules - government vessels go first, regardless of who arrives at the lock first. "Figures," says the cynic. -----Then who's next after government boats? The cynic would say, "Think about it. Who has the most influence over politicians in our system of 'democracy'? Yep, you've got it - commercial interests." Commercial vessels have the next priority. First, among the the commercial boats are the licensed commercial passenger vessels, operating on published schedules or regularly engaged in the "for hire" trade. Our skeptic would say this,"Of course. This is a 'hangover' from the steamboat days. Steamers carried people of influence." He just might be right. 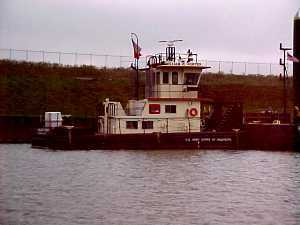 Anyway, next come any commercial cargo boats, which usually means towboats pushing barges. -----So we are back to the end of the queue - the taxpaying 'pleasure' boaters who cover most of the expenses of government. -----Our cynic adds, "What else is new? We're all used to that, so the lockage world is just a reminder of the obvious." However, there is a good rationale for the order. 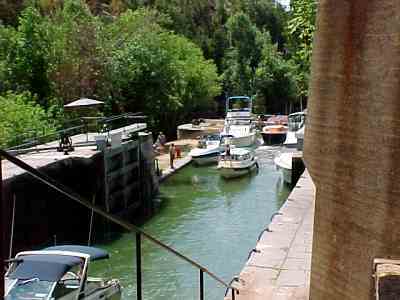 In summertime, floods of recreational boats might tie up locks and make it difficult for tows or passenger-carrying excursion boats to operate commercially on the rivers. -----Fortunately, there are some exceptions to the army's rules, although recreational boaters often do not know them. Section f states: "In order to fully utilize the capacity of the lock, the lockage of recreational craft shall be expedited by locking them through with commercial craft, provided that both parties agree to joint usage of the lock." 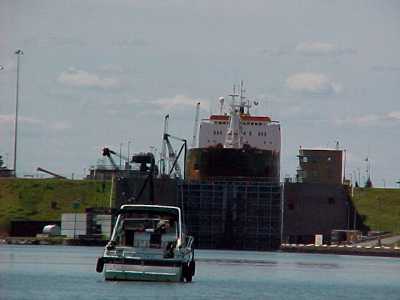 If barges contain volatile or explosive substances, the lockmaster will not allow joint lockage. You must talk with the skipper of the towboat, and he will be certain to let you know that any damage to your vessel is your responsibility. We have had interesting trips rafted to a towboat through a lock, chatting with the crew. 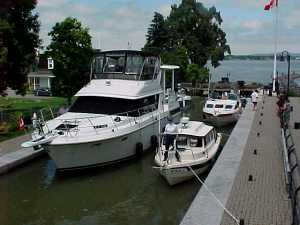 -----There is another clause in section f that is vital for recreational boaters to know: "If the lockage of recreational craft can not be accomplished within the time required for three other lockages, a separate lockage of recreational craft shall be made." We have heard horror stories of lengthy waits at a lock. 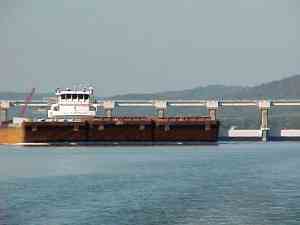 One boater, this fall, on the Ohio River, was held up for three days while commercial tows passed the lock. Obviously, this boater didn't know the law and his right of passage. The lock tender will seldom remind you of your right, often due to his ignorance of the law or his assumption that you don't know the law. -----So, remember while you wait your turn at the end of the line, and towboats cut in before you, elsewhere in the universe the planets spin and the electrons hum.